After eight months of hardship, the New Zealanders’ occupation of Gallipoli came to an end in December 1915. The evacuation was one of the few successes in the campaign, yet why did some New Zealanders write about the withdrawal with bitterness? Geoffrey S Allfree's 'The evacuation of Suvla Bay', 1915. Image courtesy of Alexander Turnbull Library, Ref: A-176-003. The onset of winter in late 1915 brought cold rain, icy wind and snow to Gallipoli. The deteriorating conditions, the failure of the August Offensive, and the Ottomans’ growing strength, finally convinced the British to order evacuation of Anzac on 22 November. Planning moved quickly and, in contrast to the rest of the campaign, efficiently. For reasons of field security, the men were told that units were being sent to rest at Lemnos, but rumours of evacuation were rife. It was hard to miss the removal of stores and the lack of new supply deliveries, among other changes to the normal routine. The evacuation of the 36,000 troops from Anzac began on 15 December, with batches shipped out each night. Support troops and reserves went first, and the fighting units thinned out until only 10,000 remained on 19 December. That night, in a carefully coordinated withdrawal from the front-line trenches, these men too were moved out. The Ottoman forces did not interfere with the evacuation at any point, although we do not know if this was deliberate or because of the Allies’ deceit. At 4.10 am on 20 December, the last men to leave Anzac Cove, a small party waiting for stragglers, boarded their boat and pushed off into the darkness. After eight months of hardship, the New Zealanders’ occupation of Gallipoli was over. The evacuation was one of the few successes in the campaign. Yet why did some New Zealanders write about the withdrawal with bitterness? Surplus stores were thrown open to the troops during the evacuation – providing a welcome change in their diet. 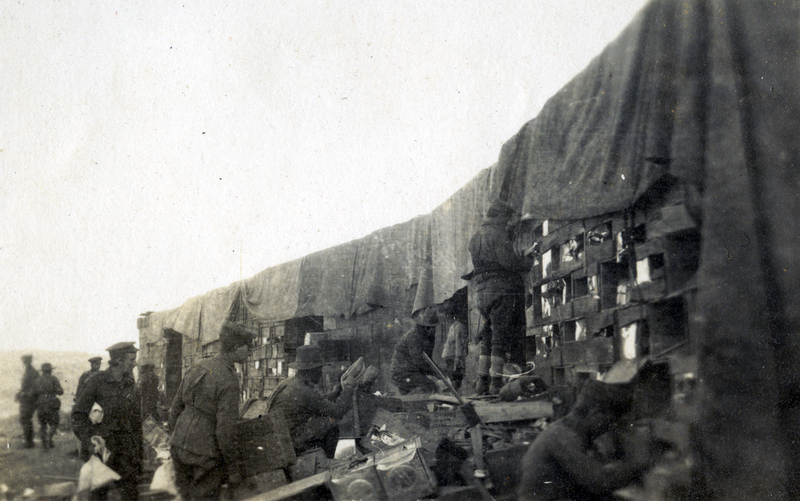 This photo from mid-December 1915 shows stacks of supplies on the beach at Anzac Cove with soldiers helping themselves. Image courtesy of Wairarapa Archives, Ref: 11-72/4-2-21. My goodness, Mother, how it did go to our hearts—after all we had gone through—how we had slaved and fought—fought and slaved again—and then to think that we had been sizzled in the heat, tortured by flies and thirst, and later nearly frozen to death. It was hard to be told we must give it up. But it was not our wasted energy and sweat that really grieved us. In our hearts it was to know we were leaving our dead comrades behind. That was what every man had in his mind. Rather than feeling relief that the doomed Gallipoli Campaign was coming to an end, Newton and Martyn lamented having to give up the positions that the Allies had taken and leaving behind their fallen comrades. 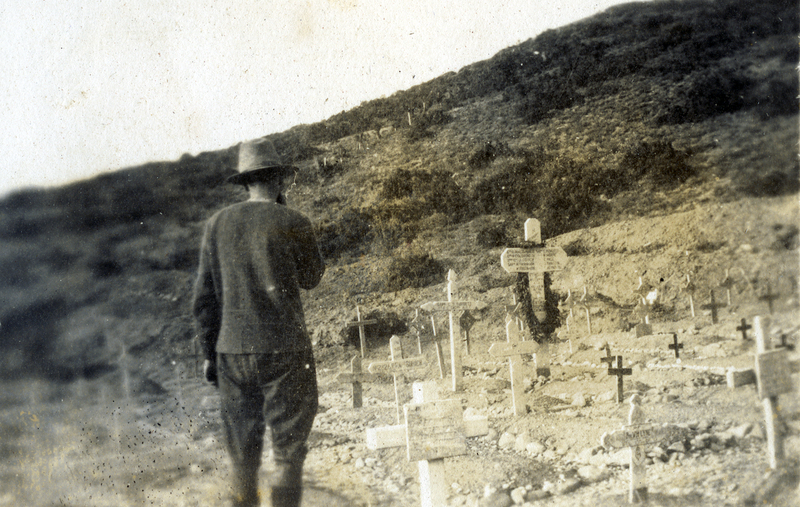 A soldier pays his final respects in a cemetery at Anzac Cove, Gallipoli, shortly before evacuation. Image courtesy of Wairarapa Archive, Ref: 11-72/4-2-19. Key to the Allies’ successful evacuation was keeping it secret from their Ottoman enemy. The Turkish Fifth Army units on the hills above Anzac vastly outnumbered the occupiers, and as troop numbers and artillery dwindled, the Allied position became increasingly precarious. The possibility of the Ottomans overrunning the Anzac sector before all the troops had been evacuated preyed on the minds of those left guarding the position. 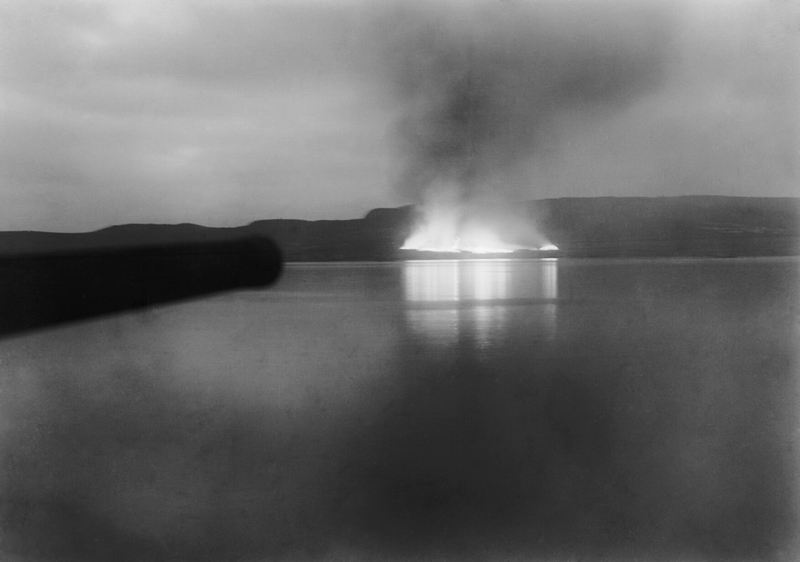 Denying the Ottomans much of the Allied materiel led to some spectacular scenes. Artillery pieces were dragged down from the hills, ammunition buried, biscuit tins destroyed and rum jars smashed. As Fred Waite later wrote, ‘everything of value to the Turk was made valueless’. The stores – usually strictly guarded – were thrown open to troops. Chadwick recorded in his diary how they dispensed with the Christmas rations: 'we had to get rid of these somehow as we couldn’t find room in our kits for them. So we made beasts of ourselves and crammed them all in to us – salmon, fruit salad, oranges, gooseberries, raisins, sardines and Ideal [evaporated] milk.’ Stores that couldn’t be removed (or consumed) were stacked up on the beach, ready for a large bonfire that followed the Allies’ withdrawal. 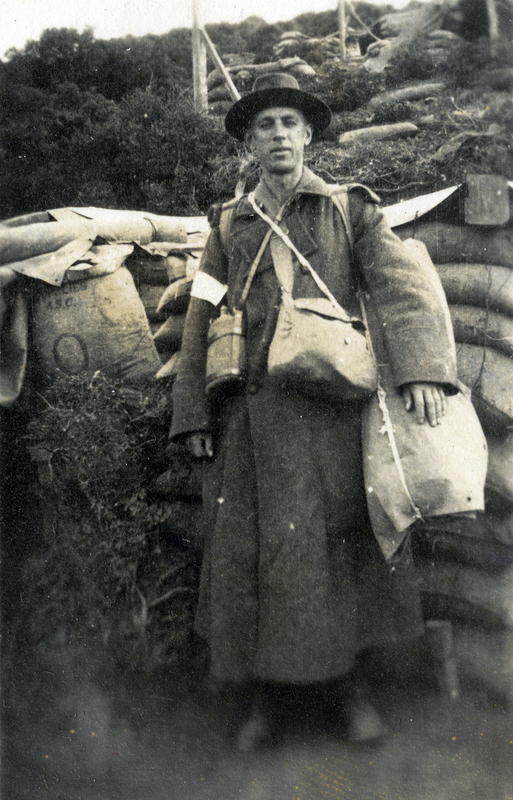 Captain Norman Prior ready to be evacuated from Anzac Cove with his belongings - including water bottle, a small and large kitbag and probably a back-pack. The white patch on the sleeve probably shows the red cross, identifying him as medical staff. Image courtesy of Wairarapa Archive, Ref: 11-72/4-2-28. Early on the morning of 20 December, the final garrison units – or ‘die-hards’ – made their way down from the front lines. Major Charles Powles was among them, and recalled the poignant descent. ‘Through the silent deres they marched, and past the silent dead, over whom loving comrades had set up crosses of remembrance in those last days. 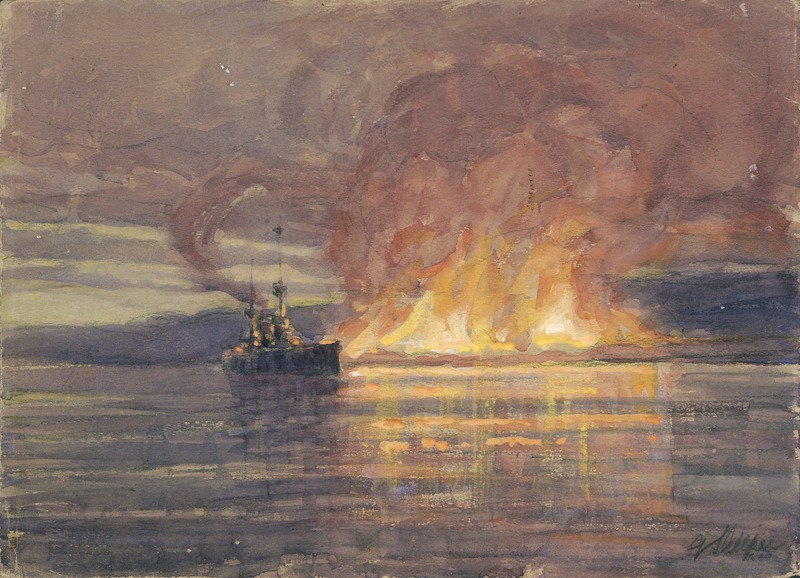 "I wonder if they hear us," passed through many a mind, and a great regret came welling up—a regret that they were being abandoned and the task not done.’ Shortly after their departure, a salvo from naval vessels offshore set alight the leftover supplies on the beach. When the ship had its overcrowded quota for that night, we moved slowly and noiselessly away from the grave of all our hopes; hopes so nearly realised by the selfless valour of those who had gone there before us. I stood on deck, looking back with mixed feelings at the broken skyline showing boldly through the murk…. Someone said “We won those ridges then we lost them, and now we’re leaving our cobbers behind. It’s damnable.” … Another said, ‘Thank God we’re leaving that bloody death-trap for ever!” I listened in silence. The Allies suffered not one casualty during the evacuation. Their plan to withdraw thousands of troops and tonnes of supplies from a dangerous position had been flawlessly executed, in stark contrast to the disastrous invasion in April that year. At home, the government and the public welcomed news of the successful evacuation with relief. The people of New Zealand cannot help regretting that the Dardanelles campaign, in which their own troops have played such a heroic part, cannot be crowned with success. But we are not going to whine and whimper about it. If our men can do better service for the Empire in some other theatre of the war we will not complain about their withdrawal from Gallipoli. Nothing can deprive the New Zealanders and Australians of the everlasting honour which they have won on that famous battleground.